In 2015–16, 11 important wetlands along the lower Victorian Murray received environmental water: Brickworks and Cowanna billabongs, Butlers Creek, Powell and Carpul lakes, Nyah and Vinifera floodplains, Neds Corner, Burra Creek North, Cardross Lakes and Lake Hawthorn. Environmental watering focused on restoring aquatic plants and improving the condition of floodplain plants. It also aimed to provide habitat for carpet pythons, bats, lace monitors, sugar gliders, catfish and Murray hardyhead fish, and to promote breeding and roosting habitat for waterbirds. Many rare and threatened species with state and national conservation listings benefited from environmental watering this year. The endangered Murray hardyhead is doing well at Brickworks Billabong (near Mildura) with 2015–16 sample catches recording more than 500 fish since translocation in January 2014. This is a good indication that Brickworks is a successful refuge site for the fish. At Powell and Carpul lakes, regent parrots, blue-billed ducks, freckled ducks and Australasian shovelers were observed. Environmental watering in the lower Murray wetlands presented a range of recreational and educational opportunities in 2015–16. 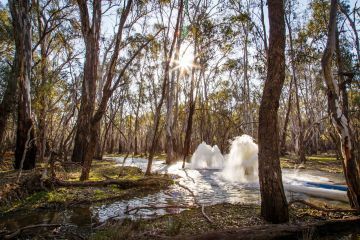 The Mallee Catchment Management Authority (CMA) focused on sharing the community benefits of environmental watering with locals. 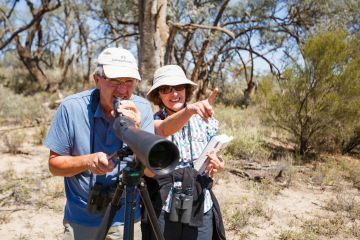 "This included everything from birdwatching and bushwalking events to the introduction of a new education program for Year 9 students focused on environmental watering in River Murray wetlands," said Mallee CMA Chair Sharyon Peart. "This unique in-field program has been delivered to more than 350 Year 9 students in the Mallee region, teaching them about everything from riparian health to environmental watering." A canoeing activity at Powell and Carpul lakes attracted over 30 people who enjoyed canoeing on the environmental water and birdwatching. The 2016 Mallee Wetlands photo competition also attracted more than 100 entries and helped capture the beauty of the lower Murray wetlands.